Dr. Palmer gives his talk. 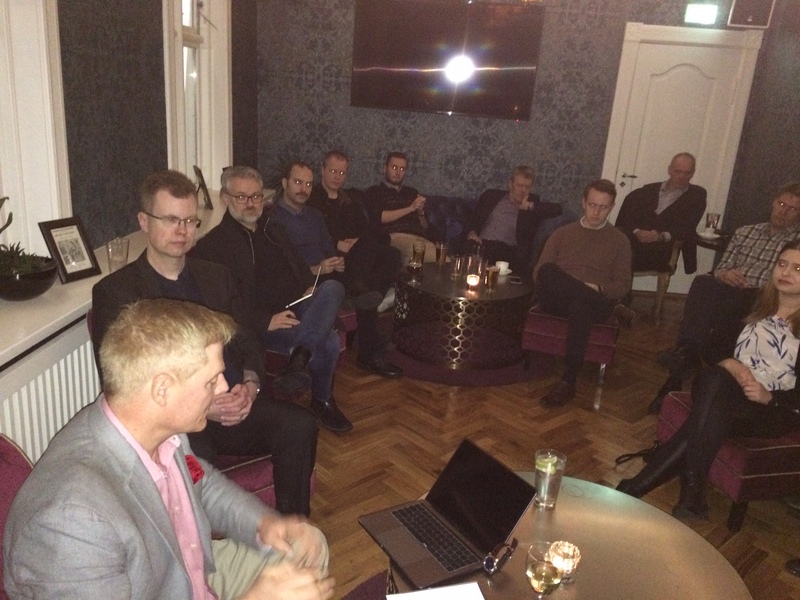 President Donald Trump is an unpredictable bully who is undermining the institutions and political traditions of the United States, Dr. Tom Palmer, Senior Fellow at Cato Institute and Executive Vice-President of International Programmes at Atlas Network, said at a Freedom Chat in Reykjavik 23 January 2018, organised by the Libertarian Society of Iceland. Palmer found it difficult to explain Trump’s election. Probably this had been a “black swan” event, when several factors suddenly worked in the same way to produce an unexpected outcome. Trump and Hillary Clinton had been unpalatable alternatives. Palmer described Trump as a ruthless power-monger who tried to intimidate both his allies and opponents. The Republicans were afraid of him whereas the Democrats were hostile towards him. If the chance would present itself, Congress would try to impeach him, although Palmer rated the likelihood of that happening less rather than more. He said that one explanation for Trump’s rise was a change in the U.S. political discourse. It was no longer about the pursuit of common rules enabling different individuals mutually to accommodate themselves, but rather about constructing collective identities, hostile to one another. Some white working class voters supported Trump because they resented the mostly negative attitude towards white people in this discourse. Thus, ironically, some left wing intellectuals bore their part of the responsibility for Trump, however loudly they denied it. The office of the U.S. President was very powerful which increased the danger coming from Trump, even if some checks and balances certainly were built into the U.S. Constitution. A lively discussion followed Dr. Palmer’s talk which took place in the Petersen Suite in Gamla Bio and was well attended.